The internet is a bastion of horror. There’s a simulator that knows how you’ll die, websites that track reported hauntings near you, and thanks to researchers from the Massachusetts Institute of Technology’s Media Lab, there’s the “Nightmare Machine,” a deep-learning algorithm that generates horrifying imagery guaranteed to make you shriek. Pinar Yanardag, a postdoctoral student at the Media Lab, told the Boston Globe that the machine was initially supplied the faces of 100,00 celebrities, which it then used to “generate faces of its own." 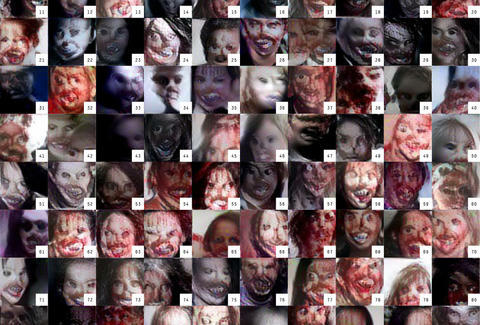 As Yanardag explains, the MIT team "‘zombified’ these faces by teaching another algorithm how a zombie face looks like.” It’s this cross-pollination of celebrities and revolting zombie faces that bred many of the repugnant images you’ll see. Befitting of the Nightmare Machine, artificial intelligence is a scary thought for humans to deal with. It breeds uncertainty, and the possibility of massive job displacement, or the equivalent of a dystopian science fiction novel coming to reality. The machine’s images of “haunted places” don’t necessarily give one the impression of War of The Worlds or I, Robot, though. The images generated are given a washy sheen reminiscent of Van Gogh’s “Starry Night,” as you can see by perusing any of them on the site. Halloween might be over, but the opportunities of scaring yourself silly online are only getting more robust, thanks to AI. So go for it, and thank the robots.